Spencer, leader of the so-called "alt-right" movement -- encompassing white supremacists, neo-Nazis and the Ku Klux Klan -- appeared Thursday on campus in Gainesville, in the north of the state. 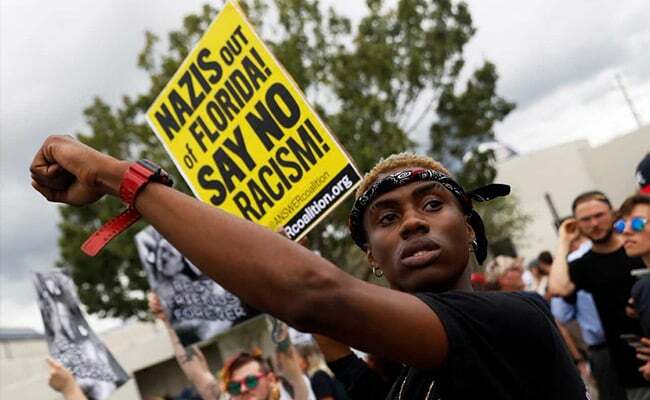 Miami: Three men were arrested after a shooting following white supremacist Richard Spencer's controversial speech at the University of Florida, police said Friday. Just over an hour after his speech ended, three of Spencer's followers stopped their car in front of a group of anti-racism protesters at a bus stop, police said in a statement. Authorities said they then threatened the protesters with Nazi salutes, chanting slogans about Hitler, before one of them, 28-year-old Tyler Tenbrink, pulled out a gun and shot at the group. The bullet hit a nearby building. Tenbrink was arrested along with brothers William and Colton Fears, aged 30 and 28 respectively. The three were charged with attempted murder. "This incident and how quickly it was handled displays the true teamwork that went into yesterday's Unified Command Center activation," said Alachua County Sheriff Sadie Darnell. Spencer, who helped organize a white supremacist rally that erupted in deadly violence in Charlottesville earlier this year, was shouted down by hundreds of protesters Thursday -- forcing him to leave the stage at the University of Florida without delivering his planned speech. Fearing a repetition of Charlottesville, Florida governor Rick Scott had declared a state of emergency Monday to beef up security ahead of Spencer's arrival -- which also sparked a street protest of around 1,500 people. Only around 30 supporters of the controversial white nationalist made it into the auditorium, massively outnumbered by protesters who chanted "No more Spencer!"